Technology and energy drove the strongest urban economies last year — none more so than in Austin, Texas, according to the Milken Institute’s annual “Best-Performing Cities” report posted on the best-cities.org site. The Texas capital topped the institute’s annual ranking based on its large and diverse tech sector. Austin not only is home to companies such as Dell and Freescale Semiconductor (and the University of Texas’ main campus), but has attracted major facilities from, among others, IBM and Apple. Overall, the institute said, Austin has the nation’s 13th-highest concentration of technology output, as measured by metro-area GDP. 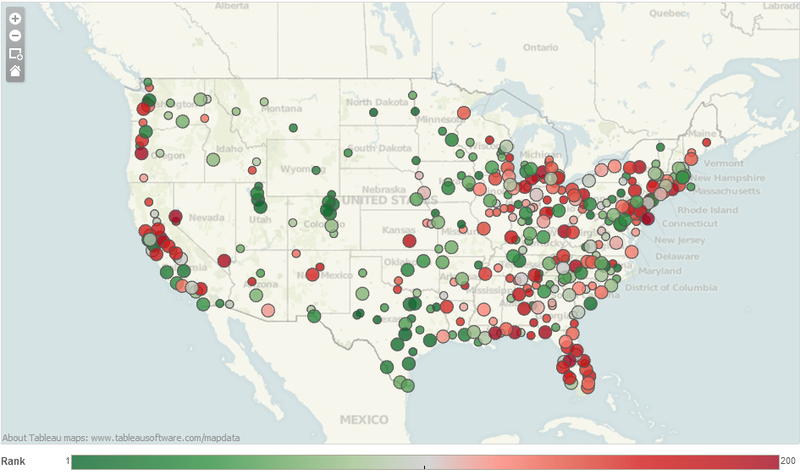 On the interactive version of the map above, you can hover over each metro area to see how it ranked; clicking on the circle brings up detailed data on how the area rated on each of the nine criteria in the institute’s index. You also can look at large and small metros separately. Following Austin were Provo, Utah; San Francisco and San Jose; Salt Lake City; and Seattle. All of those metro areas are tech-heavy, which isn’t surprising, given that measures of high-tech output and concentration account for 28.4% of each area’s score. The other criteria in the institute’s index cover short- and long-term job growth (for a total index weight of 42.9%) and short- and long-term wage and salary growth (28.6% weight). Of the top 25 large metros, seven were in Texas and four each were in California and Colorado, while only two (Trenton, N.J. and Cambridge, Mass.) were in the Northeast. Texas also claimed six of the top 25 small metros, which were ranked separately. 20 metro areas are home to six-in-ten unauthorized immigrants in U.S.